Everyone shops so why not support our congregation at the same time? Tifereth Israel Synagogue participates in programs that allow a percentage of your purchases to benefit our congregation. There is no charge to you and it’s easy. How many gift cards did you buy last year? Now you can buy them and benefit Tifereth Israel Synagogue. Keep them on hand for birthdays, bridal and baby showers, graduations, teachers, and more. But don’t stop there! You already know where you shop and what you shop for. Shop with gift cards. You can spend them like cash and Tifereth Israel Synagogue receives a percentage of the face value. An average family can generate hundreds of dollars a year in revenue for Tifereth Israel Synagogue without changing their shopping habits. That’s a significant donation! What vendors participate? Click here for a complete listing shopping, dining, grocery and entertainment options. 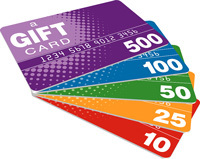 You can purchase gift cards online or phone our office at (619) 697-6001. If you would like to print out an order form and mail it or turn it into the office, click here. If the cards are available, you will be able to pick them up at the synagogue office within 48 hours. If for any reason the cards are not immediately available, we will notify you on the next business day after you place your order. Your cards will be ordered and you’ll be contacted (usually within 10 days) when your order is ready for pick-up. If you do not see your favorite vendor or have a special request, you may call the office or email us and we will contact Judy Gumbiner. Our Sisterhood’s gift card program is growing and we all want to support this effort which, in turn, supports our congregation. Without increasing your cost, designate Tifereth Israel Synagogue as the recipient of corporate donations through eScrip. Enrollment is easy. How does it work? eScrip’s merchant partners reward customer loyalty by contributing a percentage of your purchases. It’s simple and convenient, all you need to do is register your grocery club cards, debit cards and/or credit cards. Once you enroll, just shop as usual. Do it now! Log on to http://www.escrip.com/ and click on “Sign Up.” Designate Tifereth Israel Synagogue to receive contributions; our Group ID is #154842266. If you have any questions, contact our office staff. Register your grocery club cards from a participating merchant, such as VONS/Pavilions, and your debit, ATM and credit cards if you wish. Ralphs Community Contribution Program allows you to use your Ralphs card to designate Tifereth Israel Synagogue as your qualified organization. Go to https://customer.ralphs.com/ManageCommunityRewardsStep1.aspx/ to sign up. Tifereth Israel Synagogue’s NPO number is 81003. Don’t have a Ralphs Club card yet? You can do that online too! Remember that we are here to make this easy for you. Just call the office at (619) 697-6001 anytime. As always, your participation is what makes these partnerships work and your choices support Tifereth Israel Synagogue every day! Thank you.